In much of the enterprise-software world today, data is data and chat is chat, and rarely the twain shall meet. Looker aims to change all that. On Thursday the data-platform provider launched Lookerbot, a new tool for Slack's popular messaging software that lets users bring their data directly into the conversation. Looker's data platform aims to create a single source of truth so that every business team can easily ask and answer their own questions; current users include Yahoo, Warby Parker and Sony. Last fall, it rolled out a modular approach to analytics in the form of Looker Blocks, reusable and customizable apps that can be "snapped" together Lego-style to answer different questions. 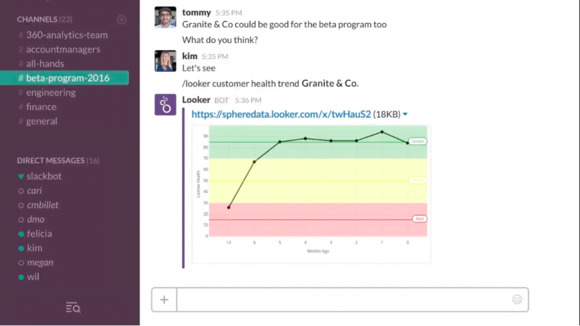 Now, Lookerbot aims to make data more easily accessible for the Slack-using masses. "Data has been something people do out-of-cycle," said Frank Bien, CEO of Looker. "Data needs to be part of the conversation, no matter where it’s happening." A single command is all that's required to find data from within Slack; when users type it, Lookerbot returns the answer directly into the Slack conversation. The data is displayed in Slack as it appears in Looker, with visualization choices including charts, maps and tables as well as custom options. Available now, Lookerbot is built using Looker’s application programming interface and software development kit. The code and installation instructions are available on GitHub. The video below demonstrates the new tool in action.